Proudly serving the Central Texas Communities of Georgetown, Round Rock, Cedar Park, Salado, Jarrell and Liberty Hill. 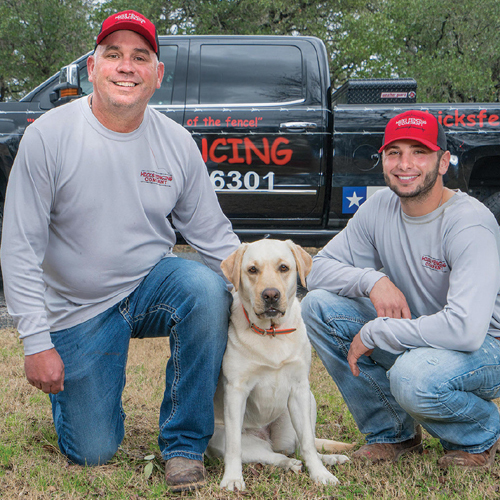 Proudly serving the Central Texas Communities of Georgetown, Round Rock, Cedar Park, Salado, Jarrell and Liberty Hill, Hicks Fencing specializes in Central Texas fence installation and repairs. Just installing a fence is not enough for Tracy Hicks and his team. Hicks Fencing insists on using superior materials so each fence will not only be functional, but also add value and beauty to the property. Tracy considers not only what the fence will look like immediately after installation, but also after it has been in place for a few years. The types of fences Hicks Fencing can install include chain link, split rail, ranch, Ameristar Ornamental Steel, wood privacy fences, vinyl, custom gates, and they also can install automatic gate openers. Fences are not all that Hicks Fencing provides. From past experience, Tracy knows that many fencing jobs also have an element of masonry to them, so he made sure to have experienced masons on his team to be able to create beautiful stone columns between pickets on wood fences, for either side of an electronic gate, or anywhere else that a customer wants a stone column. They have constructed complete fences built from stone. Like everything that Hicks Fencing produces, their masonry work is defined by its workmanship. For more information the services provided by Hicks Fencing in Georgetown, Cedar Park, Leander, Liberty Hill, Jarrell and Salado, call 512-633-6301 or email us at hicksfencing@gmail.com. With proper installation and the use of superior materials your fence will add long-term value, function, and beauty to your property. When looking at a fence our thoughts are not only what your fence looks like new, but also how it will look and function in the coming years. The later years are what define the quality of a good fence. Reaction Time – We have a sense of urgency from the time the first phone call is received, to the time the job is completed. Knowledge and Creativity – Our staff has hands on experience not only in fence installation, but has the creative knowledge that will both enhance the looks and durability of your fence. Honest and Dependable – Our word is our company. It’s that simple. We are ethical people. If we tell you we’re going to do something, we do it. Last but not least is workmanship. Experience – We have the experience and know-how necessary to build a fence the “right way”. Pride – We build every fence as if it were our own. The pride is in seeing our customer satisfied with the job we have done. Work Ethic & Respect – When we are on your property we consider ourselves a guest to you. We work hard to get the job done.